Other names: Akebi, chocolate vine, mu tong. 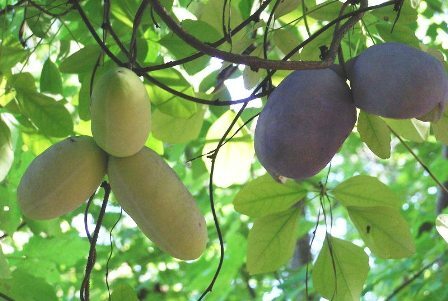 Akebia is a fruit native to China, Korea, and Japan. The flowers of akebia have a mild chocololate like smell. Due to this reason the plant is also called chocolate vine. The plants grow wild in forests, hedges and thickets in mountainous areas, forest margins along streams, scrub on mountain slopes at elevations of 300 – 1500 metres in China. A deciduous to semi-evergreen twining vine, growing upto 7-12 m tall; the vine can grow upright if it gets support or along the ground as ground cover. Leaves alternate, palmately compound, 10-18 cm across; leaflets 5, with rounded or notched leaf tips, upto 8 cm long; emerging leaves with a purple tinge, mature leaves have an attractive blue green colour. Fruit a sausage-shaped pod, about 7 to 10 cm long, purplish in colour. texture. Lemon juice is sometimes added to the fruit to enhance the flavour. The skin of the fruit, which tastes slightly bitter, is fried and eaten. Soft young shoots are used in salads or pickled. The leaves are used as a tea substitute. 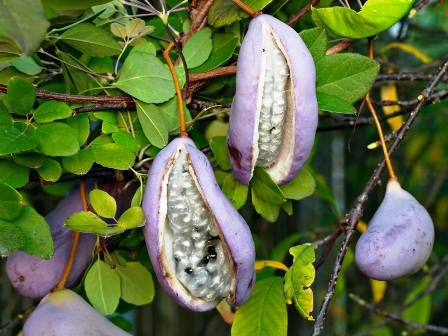 The main market for akebia fruit at present appears to be for the Chinese herbal trade. The pulpy sacks of seeds are dried as a single mass and then processed into powders or extracts. These are then used for treatment of liver and kidney disorders and other ailments. Some Chinese practitioners claim that extracts from the fruit of any akebia species are effective against hypochondriac pain. 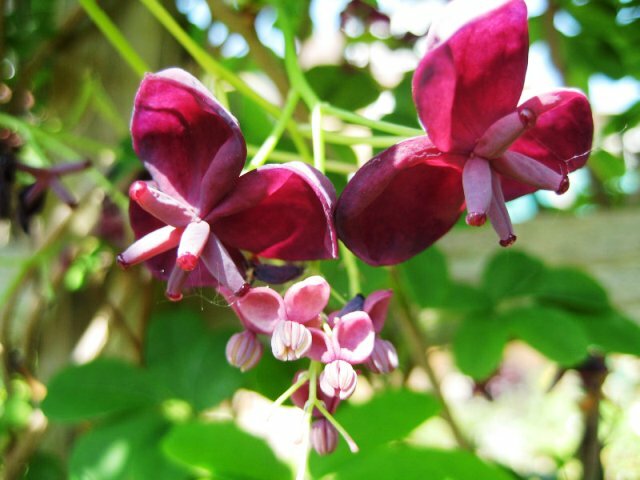 Akebia is one of those plants which are quite easy to grow. The vines would, however, require a support like a wire fence for upright growth. Though the vines can tolerate a variety of soil types but still these grow best in moist, fertile and well drained soils. 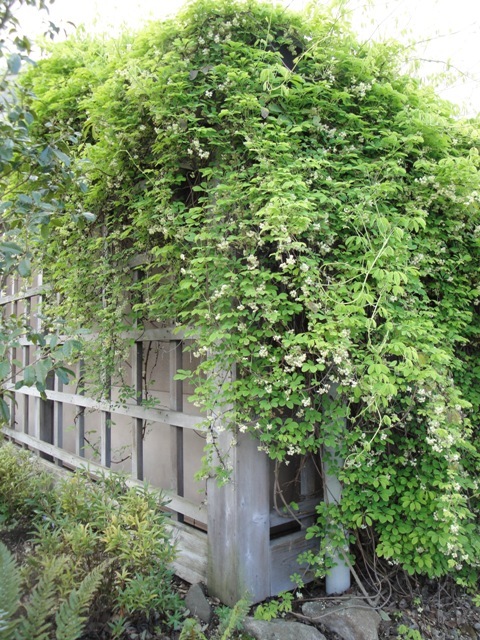 The vines are usually planted as a screen in gardens. These are sometimes also planted as ground cover. Akebia plants are shy to fruit. They possibly require some protection in the flowering season.. Some recommend hand pollination. Plants are probably self-sterile, if possible at least 2 plants should be grown side by side, each from a different source. Though the fruits are usable, yet chances of their being cultivated as a fruit crop are very bleak. The reason is that the fruit set is not adequate and the vines do not produce enough fruits to be profitable, especially under when under cultivation. Akebia is most commonly propagated by softwood cuttings. Alba: The flowers are white. The fruits are white too. Leucantha: This also has white flowers and fruits like Alba. Purple Bouquet: This is a more compact growing selection with purple blooms. Rosea: This has relatively lighter purple flowers than others. Variegata: Foliage of this variety is variegated with white. The flowers are pale pink.